The holidays are the perfect time to grab some hot cocoa, cuddle your pup, and crash the couch in the living room for some holiday movies. While there are a myriad of classic holiday films, we think it’s a good idea to switch it up and watch some dog-centric holiday films. The classic Dr. Seuss animated film is a staple for most families during the holiday season. I especially love the live-action version, which features an adorable live pup named Max. Max is the true hero of the story in my book. He had to drag away all of those gifts from Whoville. He’s also the wiser, more ethical of the two characters, cringing any time the Grinch does something selfish or wrong. Max is a true Good Boy! When Jack Skellington has the brilliant idea to try running Christmas instead of Halloween for a change, his loyal ghost pup Zero is with him step-by-step. With his glowing nose, Zero acts as Jack’s Rudolph, getting him through a heavy fog. 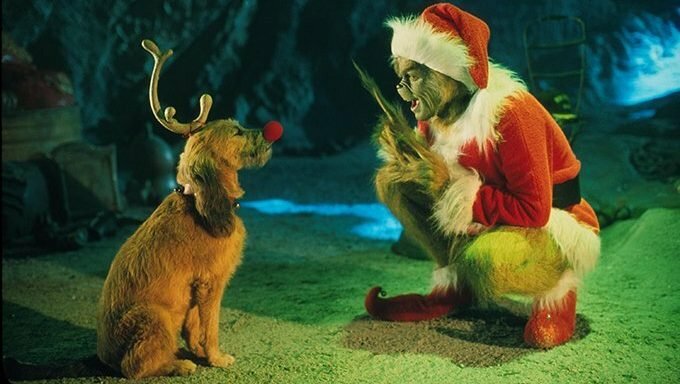 This movie is half Christmas, half Halloween, and 100 percent adorable on the puppy front. This may not be a “Christmas” movie per se, but it is one of the best dog movies that also happens to begin and end on Christmas Day. Lady is a Christmas gift to her owner. Through the year, the pampered, sophisticated Lady falls in puppy love with a streetwise mutt. On Christmas Day the next year, we see a beautiful new doggy family started by the Lady and the Tramp. We encourage making garlic- and onion-free pasta to eat instead of popcorn while watching so you can try to recreate the film’s most famous scene with your pup. There’s nothing that screams “Christmas” more than the Peanuts Gang’s dance number in A Charlie Brown Christmas. We especially love seeing the beagle Snoopy dance around to Schroeder’s piano and flip his little ears back and forth. Sometimes we even get to see the talented pup play along on a guitar like the rockstar he is. Amp up the nostalgia with this classic. Okay, so there isn’t a main dog in this story, but who could forget what happened when Ralphie and his father get a surprise visit from their neighbor’s “785 smelly hound dogs?” Thankfully, none of DogTime’s readers’ dogs are that smelly or free to roam like Ralphie’s neighbors. If heart-warming, slice-of-Americana, feel-good movies are your thing, you and your pup will definitely want to check this one out. This Hallmark Channel film tells the story of an developmentally-challenged teen who convinces his reluctant parents to foster a dog over the holidays. While easily predictable, this film will give you all of the warm and fuzzy holiday feels. Have any doggy holiday movies that are your favorites? Let us know in the comments.